"It's quite an experience to be in a room packed with almost every one of your heroes" said Joe Bonamassa in accepting the Breakthrough gong at last night's Classic Rock Awards. It's a sentiment we have to admit to sharing. On arrival at last night's awards - hosted at London's regal Park Lane Hotel - MusicRadar was greeted with an awesome barrage of celebrity the likes of which we'd never seen. Look, there's Slash! There's Ronnie Wood! Pete Townshend! 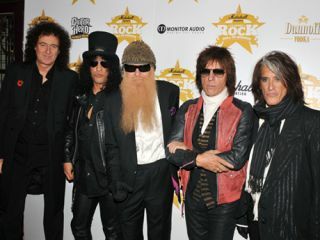 Brian May, Jeff Beck, Billy Gibbons, Tony Iommi, Jimmy Page, Ginger Baker! These were people whose music we'd grown up listening to - bona-fide rock legends we'd idolised as kids, now all together under one roof. Ronnie Wood wearing a shirt he painted himself. We used the reception drinks time to corner a few celebs with a Dictaphone, quizzing rockers on their favourite riffs of all time (the fruits of which will feature in MusicRadar's upcoming Riff Week). Far from the brusque or even plain rude rockstar stereotype, we found Billy Gibbons, Tony Iommi, Jeff Beck and the others we interviewed to be genial and charming. Brian May in particular was a gent, musing carefully on our riff-based enquiries with all the intellect and eloquence we'd expect from the learned rock legend. While it was a real thrill to meet our heroes face-to-face, the headline attraction was, of course, the ceremony itself. So with rockstars shepherded to their tables, the awards kicked off proper, hosted by the ever-articulate Danny Bowes from Thunder. Iggy Pop scooped the Living Legend award (sounds weird, but we almost didn't recognise him with his shirt on - although he did take it off later for a photo), presented by Chrissie Hynde of The Pretenders. Other high-profile awards went to Chickenfoot for Best New Band and AC/DC for Best New Album with Black Ice. Ronnie Wood picked up the Outstanding Contribution gong, presented by The Who's Pete Townshend (there was a rather bizarre moment when Townshend 'handled' Ronnie's hair) while Iron Maiden won Best Band. Aside from awards, there were also several strong performances. Joe Bonamassa treated the audience to an astoundingly good acoustic blues set (his vocals and guitar playing as strong as ever) and Billy Gibbons delivered a great anecdote - the best of the entire evening. And yes, he's the one on the left. Don't forget to head over to Classic Rock's website for all the rest of the gossip, photos and video of the event, and stay tuned for MusicRadar's Riff Week where we'll be revealing the all-time favourite riffs of Brian May, Joe Bonamassa, Jeff Beck and more!